The mission of EENI Business School & HA University in Africa is to facilitate access to the growing demand in Africa for higher education in international and inter-African business that cannot be covered by traditional universities at affordable prices for all Africans. The objective of EENI Business School & HA University is to offer in Africa Bachelors of Science, Masters and Doctorates at a price of €1,000 per year. Africa is the world region with the higher grown in tertiary education enrolment. The University does not intend to compete with most of the existing universities in Africa, which generally target other segments of the population. 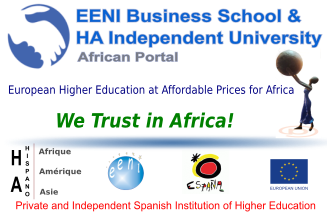 The EENI Business School & HA University aims to provide affordable higher education to the increasingly impoverished African and Latin American middle classes (due to the economic crisis and reduction of financial resources for higher education of many governments), and access to a new segment of population practically excluded from tertiary education. EENI Business School & HA University uses new technologies and pedagogical methodologies (distance education, EAD and/or traditional face-to-face education), to provide Africans with access to quality higher education at affordable prices.